Aeshna juncea hovering over a pond. 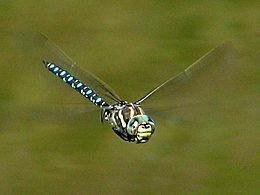 The Odonata are an order of flying insects, the dragonflies and damselflies. Like most of the flying insects (flies, beetles, Lepidoptera and Hymenoptera), they evolved in the early Mesozoic era. There are other views on the classification of the Odonata, but this is as much as anyone needs to know in order to enjoy this beautiful group of insects. 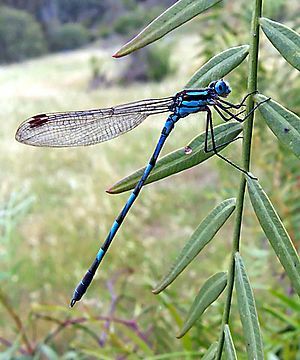 All Odonata have aquatic larvae called 'nymphs', and all of them, larvae and adults, are carnivorous. The adults can land, but not walk. Their legs are specialised for catching prey. These insects characteristically have large rounded heads covered mostly by big compound eyes, legs that catch prey (other insects) in flight, two pairs of long, transparent wings that move independently, and long abdomens. They have two ocelli (eye spots) and short antennae. The mouthparts are on the underside of the head and include simple chewing mandibles in the adult. Odonata Facts for Kids. Kiddle Encyclopedia.